Blind spots have been something every driver simply has to live with. A-pillars are essentially attaching a car’s roof to the rest of the vehicle and keeping the windscreen in place. Obscuring a portion of a driver’s view of the road, they pose a safety hazard to pedestrians and vulnerable road users. However, that is all about to change after Continental revealed what is essentially a see-through A-pillar. This isn’t the first time we’ve seen transparent A-pillars. Jaguar Land Rover was showing them off back in 2014 and Toyota patented the idea in August 2017, but nonetheless, Continental’s take is the latest and perhaps most impressive example so far. 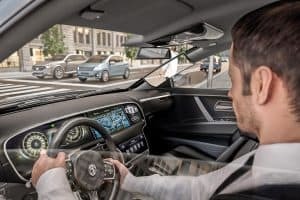 Continental’s Virtual A-Pillar works by tracking the driver’s movements with an interior camera mounted above the steering wheel and displays an image of the vehicle’s exterior environment on the interior OLED displays on the A-pillar, enabling the driver to “see through” it. With more car makers using the A-pillar to house safety equipment, the advanced technology addresses an increasing issue on newer vehicles that may require even larger front pillars. A spokesperson from Continental said the driver ultimately feels like they’re looking through an extended window, rather than at a live video feed. It remains unclear if or when the technology would appear on a production car, but the system is certainly a step forward in improving road safety and minimising the potential for accidents.